And the winner of a ticket to the Boston Brunchers Birthday Brunch is….Baking Me Hungry who said “We love brunch because after sleeping in, brunch embodies Lazy Sunday. Who doesn’t love unlimited coffee, eggs and good conversation!” Congratulations! Now, onto to some yumminess! Like so many others, on the first chilly day of fall, it is a tradition for me to run out and grab some kind of autumn flavor inspired coffee. And yes, it is usually something to do with Pumpkin. Well, at least until December rolls around and then my heart (and my taste buds) belong to chocolate – peppermint flavored caffeine! 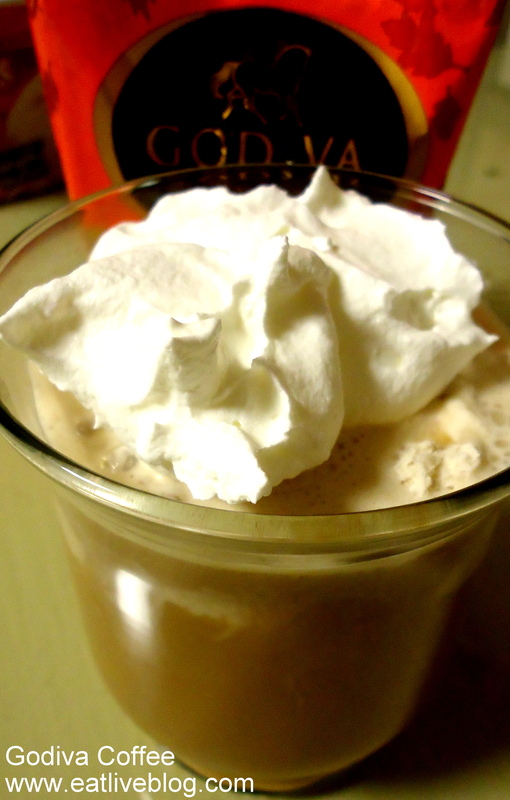 On the first crisp day of this year, I was lucky enough to receive a package from the Foodbuzz Tastemakers Program with 2 bags of Godiva’s new flavored coffee. As soon as I saw the coffee, I knew that it was destined to be made into one of my childhood favorites…an Eiskaffee! My dad used to tell me stories about going to the Seaport in South Africa and sitting on the water and enjoying an eiskaffee. So the first time I went back to visit our homeland, it was the thing that I most wanted to do (I was 8). And it is one of the things I remember the most about that trip. Eiskaffee is really so simple, I am not sure why it hasn’t caught on in the states yet. It is basically ice cream and brewed coffee. Bam! Instant deliciousness. So, when I saw the pumpkin spice coffee, I knew I had to introduce this bit of heaven to the USA! 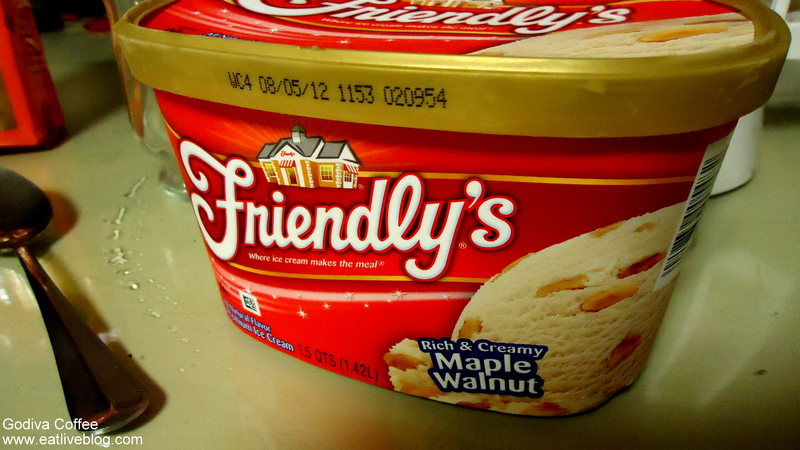 I was happy to find some Friendly’s Maple Walnut Ice Cream in the freezer. In the midst of all the drama surrounding the New England institution this week, I thought it would be nice to include them in my dessert. The scent of pumpkin (nay, the scent of fall!) filled the air as the coffee began to brew. I was worried for a minute that the coffee may be OVER flavored since I am not a huge fan of an incredibly over powering pumpkin flavor. But no, this coffee was actually “seasoned” with just the right amount of flavor. 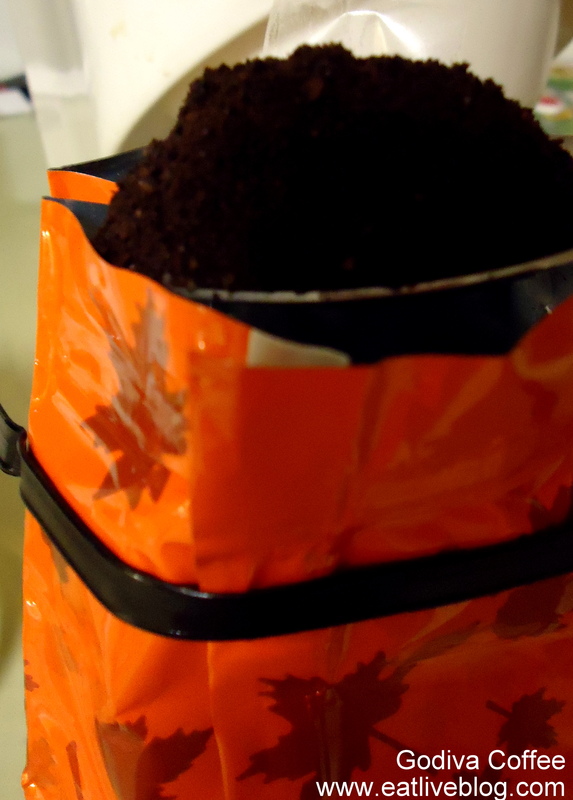 A nice, smooth, medium roast coffee with a hint of pumpkin spice. The almost would be the fact that the ice cream had walnuts in it, something I completely overlooked. So it was kindof…blech (for lack of a better word)…to be sipping this fabulous drink and have a wet walnut join the mix. So, I think I will stick to vanilla ice cream for this in the future. Oh, and there will be MANY more of these in the future! Best when sipped slowly through a straw while enjoying the company of family or friends! 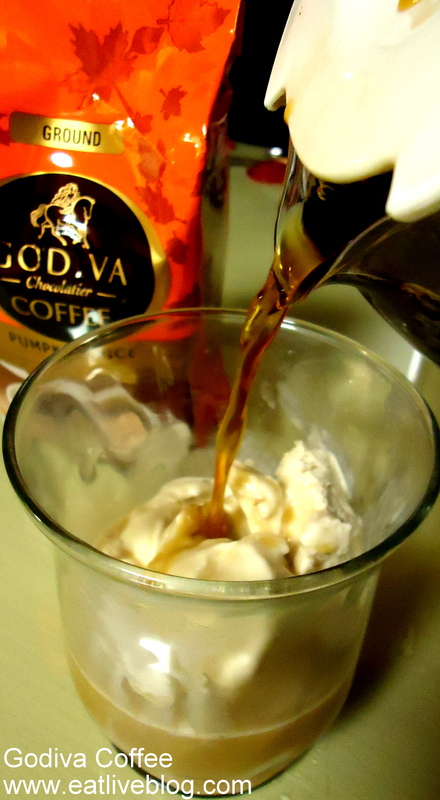 Disclosure: I was sent 2 bags of Godiva Coffee, free of charge, courtesy of the Foodbuzz Tastemaker program. I was not required to write about the coffee. As always, all opinions expressed are my own. This entry was posted in Recipes, Reviews by reneeh. Bookmark the permalink. This looks like a fantastic fall treat! I’m looking forward to catching up with you this weekend! It sounds similar to an affogato — espresso poured over ice cream. Great combo! Oh my goodness this sounds like incredibly delicious coffee. I’ll have to try it!